I started subscribing to the Imperfect Produce box (see this post), and this week’s box came with a big ol’ bunch of collard greens. 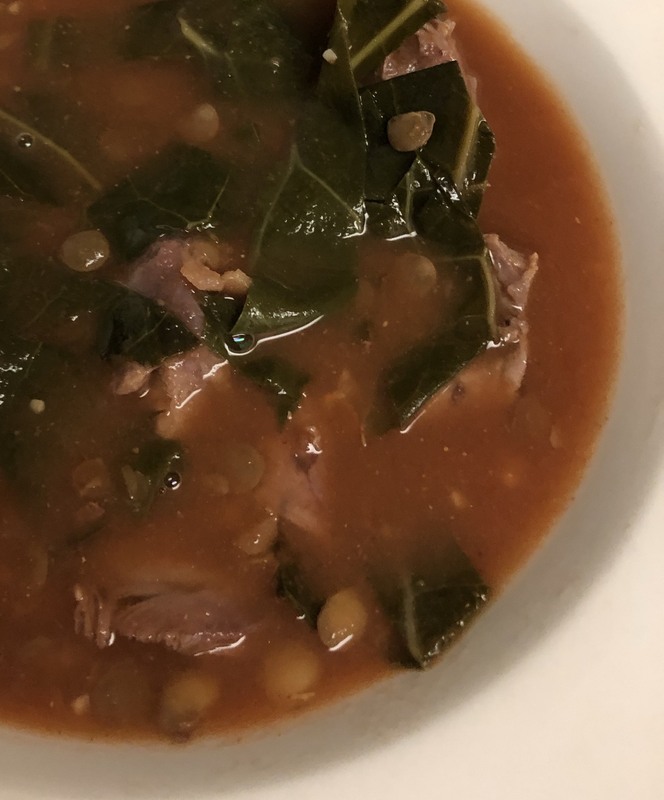 I decided to use them to make a lamb shank and lentil stew with collard greens. Brown 2 lamb shanks in olive oil and remove from pan. Wilt 1 bunch chopped collard greens with 1 teaspoon minced garlic in olive oil. Stir in 1/2 teaspoon chipotle or chili powder, 1 teaspoon coriander, and 2 teaspoons cumin. Add 2 c stock (I used mushroom) and 3 c water and bring to a simmer. Add 3/4 c green lentils and both lamb shanks. Simmer for 45 minutes. Skim foam and fat off of the top from time to time. Remove each lamb shank, cut the meat from the bone, cut into chunks, and toss back into the soup. Add a 15 oz can of tomato sauce and heat through. Salt to taste.